“The D Train” opens Friday at Point, Star Cinema and Sundance. R, 1:37, two and a half stars out of four. And then . . . boom. This is a much weirder and darker comedy that one might expect, like “The King of Comedy” as played out on the parquet floor of a high school gymnasium. 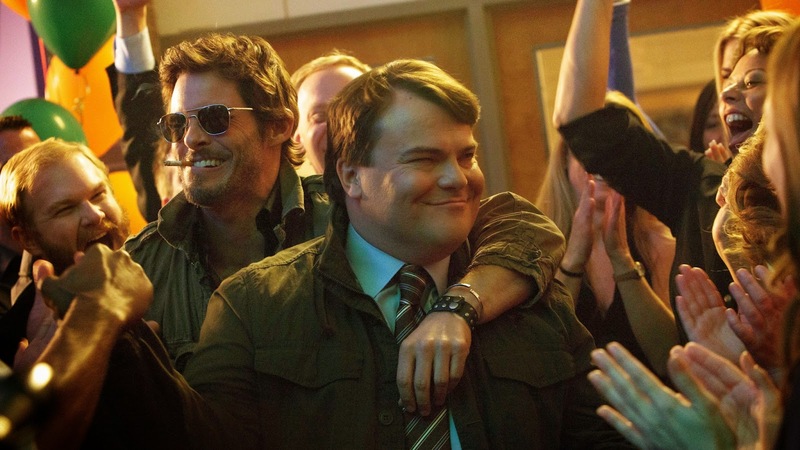 Jack Black has the Rupert Pupkin role as Dan Landsman, a sad-sack middle-aged dad still reliving his high school glory days, glory days that probably never happened in the first place. He’s one of those guys who says he was friends with everybody in high school, but in reality was likely friends with nobody. As chairman of his alma matter’s 20th reunion committee (a leadership role he clings to, refusing to give anyone else the Facebook password), Dan has a brainstorm to pump up attendance for the reunion. He’ll invite Oliver Lawless (James Marsden), the coolest guy in his graduating class, now an actor living in Los Angeles. He must be famous, Dan reasons — Oliver’s on a Banana Boat commercial and everything! Dan heads to Hollywood, telling his wife (Kathryn Hahn) and his boss (Jeffrey Tambor) that he’s going to meet with a client. Meeting cool-guy Oliver, Dan hides his hero worship by pretending he’s hipper and more successful than he really is, employing a barrage of awkward faux-“Entourage” slang (he variously gives himself the nickname “D-Money” and “D-Man.”) Oliver seems genuinely cool, but he’s also pretending to an extent; he gives up the game when he runs into an actually successful actor in a club (Dermot Mulroney, of all people) and becomes a tongue-tied fanboy. In the end, both Dan and Oliver are on the lower rungs of life’s ladder, telling themselves they’re higher than they are. Dan and Oliver end up bonding — really bonding — over a hard night of drinking and drugging. Herein lies the central spoiler of the film, which I will gingerly tiptoe around. But suffice to say that, when Oliver agrees to run to the reunion, Dan becomes desperate to find out whether he’s really, finally tight with the coolest guy in school or not. 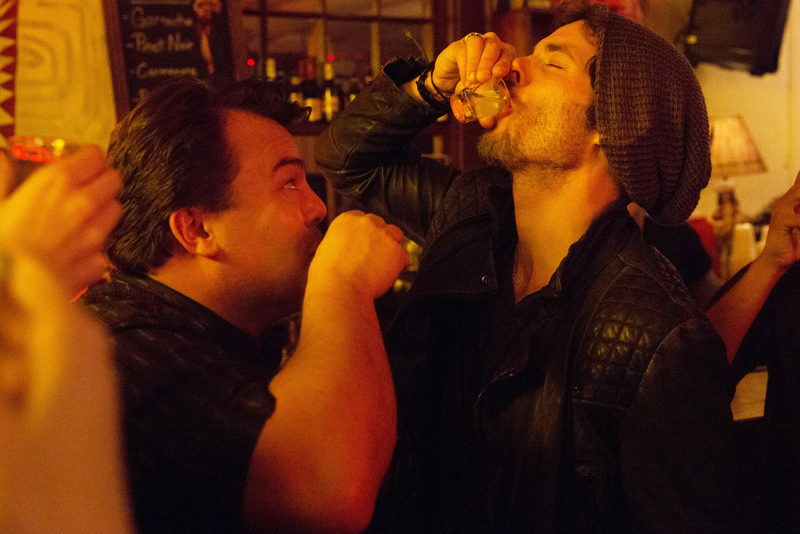 THE D TRAIN – 2015 FILM STILL – Jack Black (Dan Landsman) and James Marsden (Oliver Lawless) – Photo Credit: Hilary Bronwyn Gayle. An IFC Films release. The screenplay by first-time directors Jarrad Paul and Andrew Mogel (“Yes Man”) subverts our expectations, that it’s Oliver who will manipulate the guileless Dan. In fact, it’s Dan who is the manipulator. Black seems to really relish the different, not necessarily nice layers underneath Dan’s doofy exterior, as he keeps his friend, and his wife and his boss all believing different stories. Living a lie may not be ethical, but for Dan, who has been stewing in quiet self-loathing all his life, it can be a lot of fun while it lasts. “The D Train” starts to fizzle in the third act, when Dan’s lies and manipulations finally start to unravel. The film loses its nerve a little in its quest for a satisfying ending, and the suggestion that Dan has somehow grown or learned from the experience feels false. Still, “The D Train” is worth seeing for the unexpectedly dark places it goes — I’d like to see a “Hangover” movie try this.